Beach cleanups can reduce litter, protect our ocean and raise awareness about litter and plastic pollution. The Surfrider Foundation's volunteer network conducts beach cleanups throughout the West, East, Gulf, Hawaiian and Puerto Rican Coasts. Our National Beach Cleanup program provides a fun and easy way to volunteer and engage with our mission to protect our ocean, waves and beaches. Volunteers of all ages, community groups, tourists, clubs, local and corporate businesses and elected officials around the country contribute to the success of this program and are essential to keep our beaches and coastline clean. Launched in 2018, the Better Beach Alliance was developed by the Surfrider Foundation and REEF to expand the impact of Surfrider’s beach cleanup program and amplify the amount of trash removed, volunteers engaged and events hosted. 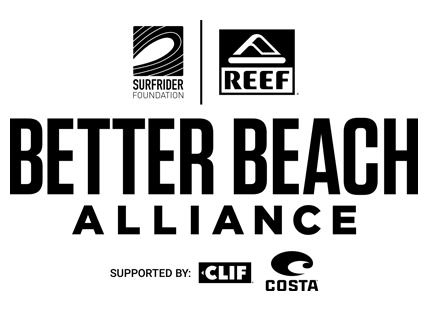 This year, the Better Beach Alliance's impact will continue to grow with the support from our title sponsor REEF and supporting sponsors Clif Bar and Costa. This year we have set the intention to increase the impact of our program through our 2019 goals below. Find your local chapter and explore their beach cleanup schedule for upcoming volunteer opportunities. Cleanup schedules can often also be found on a chapter's Facebook events page.